Walking along the beautiful sandy beaches, enjoying the mesmerizing views of hilly tea estates and serene historical sites in the ancient capital, and getting a lifetime experience of climbing Adam’s Peak… now you can experience all of these and more, just at the touch of a button with Uber. 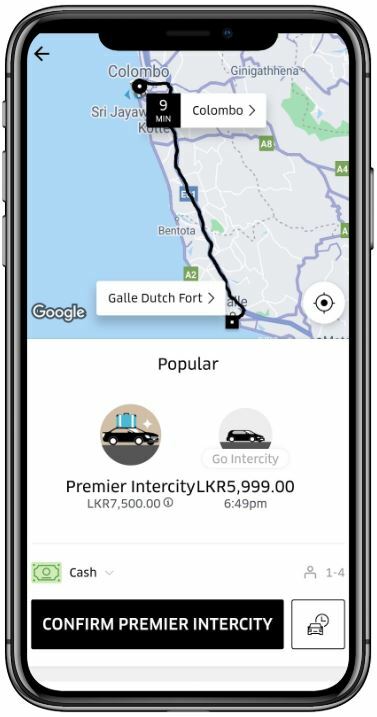 Your Uber now gives the opportunity to visit key destinations around Sri Lanka on two-way travel. Yes, we are launching Intercity trips to all outstation destinations in the country. So, start exploring the paradise! Intercity rides are available round the clock and on-demand. You also have the flexibility to select your pickup and drop-off location and choose between several ride options to suit your need. You’ll be able to enjoy affordable fares to key locations around the country. Fares will be based on the time and distance, which will include a minimum base fare. If you travel beyond the destination city limits, fares will be calculated on the additional distance traveled and time spent. Here are a few estimated fares to some of the key destinations around the country. So, it’s time to get the best out of your holidays with family and friends. Don’t let another long weekend slip away. After all, your family vacation is now just a tap away on the mobile phone. Keep on exploring Sri Lanka. Open your Uber app & enter the destination in the other city. Payable by cash or card at the end of the trip.